April in Vietnam is big! Why April? The weather is warm but mild, it doesn’t rain too much, and a number of events coincide with local traditions, including Reunification Day (April 30) and International Workers’ Day (May 1). There’s a lot going on! A long weekend! First, a warning: Reunification Day and International Workers’ Day fall on a Monday and Tuesday so lots of Vietnamese will use the long weekend to take quick trips back to their hometowns, travel, and attend pilgrimages to popular temples. So read on, but remember to plan and book early for anything you’d like to do near the end of the month! Add an extra hour to your departure time at the airports as well. Ho Chi Minh City Tourism Day 2018 - themed "Exploring Summer,” the event will be organized at the 23/9 Park in District 1 from April 12 to 15 with more than 150 travel agents, cities, and provinces pushing their brands and offering tourism products to local and international travelers. If you’re thinking about spending time in Vietnam, there will be plenty of exciting ideas on offer. Reunification Day in Vietnam marks national reunification in 1975. Although September 2 is National Day, Reunification Day is the biggie. Look for parades, noise, flags, and people across the country using the day to kick back and relax. Hung King Temple Festival is held from April 21 to 25 in Viet Tri City, Phu Tho Province (northern Vietnam). It’s the death anniversary of the Hung Kings, the earliest rulers of Vietnam. It’s a symbol of national unity and draws a huge crowd each year. The event features a big parade and plenty of photo ops. Make sure to bring lots of water! Hue Festival - Themed “Cultural Heritage with Integration and Development; Hue – One Destination, Five World Heritages,” the 10th Hue Festival will be held from April 27 to May 5 in Thua Thien-Hue. There are shows at the Hue Citadel and a fabulous street parade which now features international acts in additional to local performances. Book your hotel and arrive early for this one. The city also has many high-quality local and international restaurants. Da Nang International Fireworks Festival: This is a major summertime tourism event in the central region. 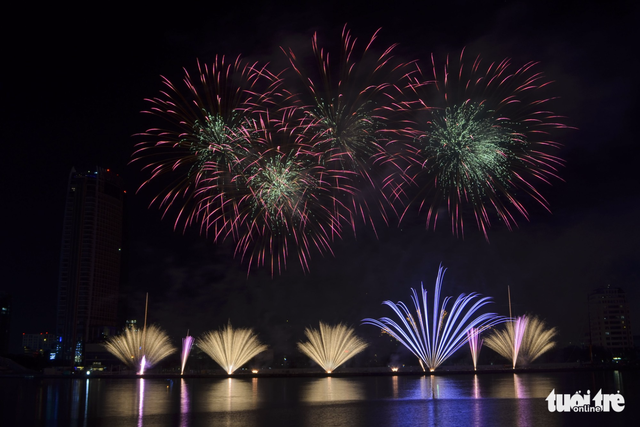 This year’s festival will last for two months, from April 30 to June 30, and feature fireworks displays by teams from Vietnam, Poland, France, the U.S., Italy, Hong Kong, Switzerland, and Portugal. The best thing about this festival is that there is plenty of time to travel around central Vietnam between the firework events. Since Hoi An, Da Nang, and Hue are fairly close to each other, getting around is relatively simple. Other options in April might include a visit to Ha Long Bay, which also holds its own tourism festival during the month. Phong Nha Park, home to the biggest known caves in the world (north of Hue) is accessible by road and air from Dong Hoi City on the coast. It’s perfect to visit at this time of the year due to the weather and the lack of Vietnamese crowds. The area also played a big part in the Ho Chi Minh Trail story from the American war in Vietnam. If you have time, check out The Pub with Cold Beer, the Bomb Crater Bar, and Phong Nha Farmstay. Right-ho! That gives you a starting point to get out and about. If you’re new to Vietnam, remember to have some patience with the local way of doing things which, at times, can be fairly chaotic. With money; the golden rule is ask first! Even if they can’t tell you in English, everyone (and I mean everyone!) can show by a calculator or writing it down. Secondly, shop around if you have time, there’s no reason to leave your ‘business sense’ at home – stay savvy. Finally, don’t argue – just leave; don’t lose your cool over a few bucks. You’re here to have fun, not prove a point. I’m a great tour guide, huh? Hope you have a great April!